Children are often found to have heart a murmur when seen in the Emergency Department (ED), but when does a heart murmur actually mean something? Most of the murmurs that we hear are benign, physiological or flow murmurs. All of those terms basically mean the same thing the anatomy is normal, the child is healthy and yet there is an extra noise heard on auscultation of the heart. A heart murmur can also be a sign of cardiac abnormality. When children present to the ED a cardiac cause for their symptoms is not usually top of our list of differential diagnoses because respiratory and musculoskeletal cases are far more common reasons for pain and dyspnoea. This coupled with the way that cardiac problems present (with vague symptoms easily attributable to more common illnesses) make these rare clinical scenarios into the stuff of our worst fears. In short, heart murmurs are almost always nothing to worry about. Almost. Lets look at a few made up cases to illustrate how to approach the Oooh-Ive-heard-a-murmur-what-now? scenario. A 3 year old child presents with a febrile illness. Lets say that they have an otitis media. They have a heart rate at the top of the reference range for their age and you hear a murmur. The murmur is soft, easily heard (but not loud), systolic and heard best at the left sternal edge. There is no radiation. In emergency medicine, we are all about the focussed history and examination. We have to be in order to keep all of our patients safe (if you come from a paediatric background, it is time to stop drawing those family trees and see a few more patients every shift please). That focussed approach works well, but when we find something that we werent expecting, we need to go back and get more information. In this case, we want to know if the child is known to have a heart murmur. Have they had an echo done in the past? We also need to feel the precordium for heaves and thrills and be happy that the pulses have a normal character and volume. Make sure that the femoral pulses are palpable, with no brachio-femoral delay. Check for hepatomegaly. Most importantly, make sure that the child does not have increased work of breathing and does not seem unexpectedly unwell. Ideally, we need to get a blood pressure checked. If the child is well, there are no red flags and the murmur sounds benign (as in the original description for this case) then the child can be discharged with safety netting advice. The presumption is that this is a physiological murmur which has been heard because the illness is causing increased cardiac output and therefore turbulent blood flow. The final piece of the jigsaw is that you need the help of your patients GP. It is common practice to get the child to see their GP as soon as possible once they are well. It is likely that when they are seen, the murmur will no longer be heard. In these circumstances: case closed. If the murmur persists, the GP can refer the child (either for an echo or to paediatrics if they dont have direct access to this), assuming that the child remains red-flag-free. A two month old baby presents with a runny nose, cough and a low grade temperature. The parent has noticed that their baby has started to have slightly fast breathing and has not been feeding as well as they normally do. On examination, the baby has a slight wheeze, mild recession and basically looks like the other babies with bronchiolitis that you have seen that week. All except for one thing: they have a soft systolic murmur that you can just about hear over the wheeze. In short, refer to the acute paediatric medical team. This child might have bronchiolitis and a flow murmur, but there is every chance that they are just pretending to have bronchiolitis. Babies who have a ventricular septal defect (VSD) might not be picked up on screening (newborn baby checks etc.) and may have no overt symptoms, until they get their first cold. Then, shortly after becoming snotty, the illness tips them into heart failure. What does heart failure look like in a baby? Well, they have increased work of breathing, a bit of a wheeze and struggle to feed. Does that sound like bronchiolitis or does that sound like bronchiolitis? The course of the illness is different they continue to get worse, while bronchiolitis symptoms peak at day 3-4 of the illness. Monitor the baby closely while waiting for the paediatric team to see the baby. If they have significant work of breathing, hold off from letting them have a feed just now. A chest X-ray will probably be useful for the paediatricians. A fourteen year old presents a few days into a flu-like illness. They have been seen by both GP and ED in the past few days, and have been told that they have a viral illness. On both occasions they were advised about symptomatic treatment. The parents are concerned that the young person is not getting better. On examination, there is a barely audible systolic murmur. Dont presume this to be a flow murmur. Firstly, in the context of viral illness, flow murmurs are most commonly heard in younger children. Secondly, the scenario is all wrong for that. In Emergency Medicine it is always possible to put two and two together, thinking about the scenario as a snapshot rather than fully appreciating the whole issue of the context of that snapshot. In this case, the temptation would be to say that illness plus murmur equals flow murmur. When you take into account the childs age and the fact that the murmur was not heard on previous visits you get a very different differential. One possible diagnosis here is viral myocarditis. Other possibilities include bacterial endocarditis. An ECG and a chest X-ray should be performed. 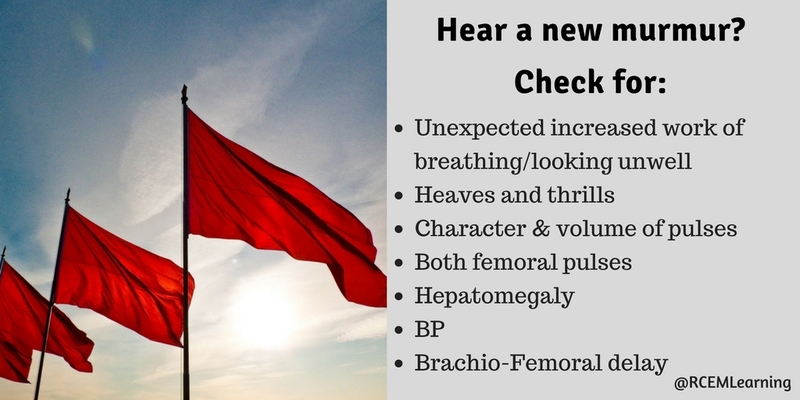 In some EDs you might be able to access urgent echocardiography. The likely outcome for this patient regardless of availability of investigation is that they should be referred acutely to paediatrics. If we are going to talk about adding two plus two, then a child who has a protracted illness and who develops significant clinical signs late in the illness will almost always warrant referral for observation at the very least. 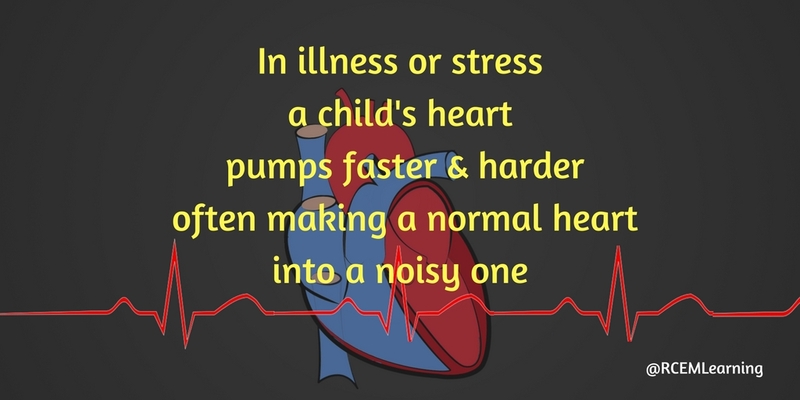 One general rule which works quite well for symptoms in children (in the context of heart problems) is this: An isolated sign or symptom is almost never indicative of significant pathology. 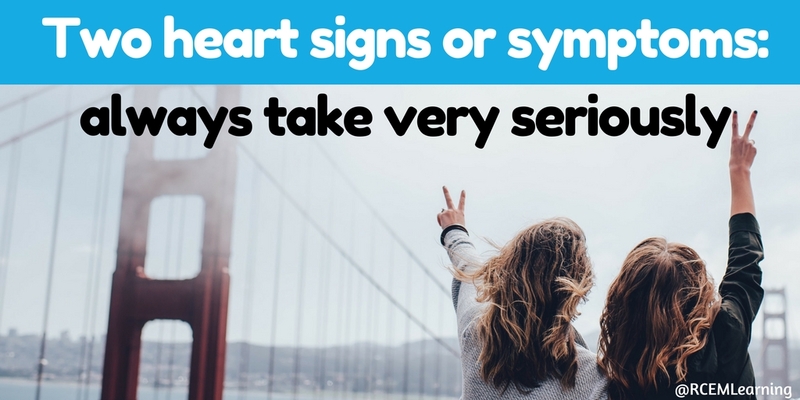 Two signs or symptoms is always worth taking very seriously. Take chest pain in children. I dont expect chest pain to be due to a cardiac cause in children (because it almost never is). However chest pain in combination with syncope, dyspnoea or palpitations is presumed to be pathological until said pathology is excluded. So, as with many presentations in children, everything is normal except when it isnt. Many thanks to Dr. Carrie Mackenzie (Consultant paediatrician) who peer reviewed and proof read this piece. The author, Edward Snelson, runs his own excellent educational blog on paediatric tips here. Interesting topic, thanks to the author. I agree with the family tree.